Isaac Brock's grasp on mortality is still marked by nervous bits of energy, but never has his group sounded so full and melodious. 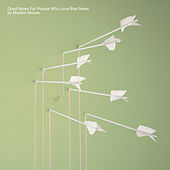 Even though an array of ornate instruments replaces the scratchy, explosive bits, Modest Mouse retain their original approach to guitar sounds and unique song arrangements. 2004 Sony Music Entertainment Inc.